My dad put each of the five CDs into our SUV’s disc-changer as we set out. As always, we were on our way to northern Michigan to be absorbed into a larger family gathering. I’d unwrapped the Silver & Gold box set that morning, and we were going to listen to it for the first time as we drove. It happened that the trip and the CDs lasted the exact same length, so it was somewhere in the backwoods of Cadillac where “Do You Hear What I Hear?” broke down and my mom asked if we could maybe skip ahead. 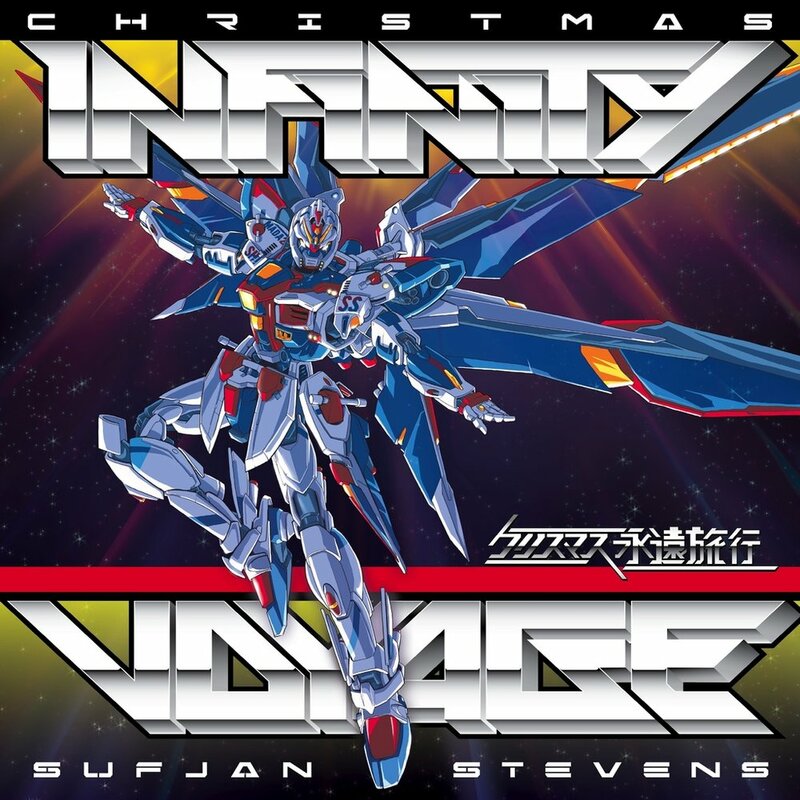 There are diverging timelines of Sufjan. Generally, we recognize the one where “he has like a whole album about a wooden chair that makes me sob uncontrollably.” In a supposedly anonymous essay surrounding the vinyl re-release of Enjoy Your Rabbit, the writer invites us to imagine a world in which Stevens continued to make “freakout” avant-garde electronic in obscurity. And it might be nice to overlook. But this music is no less his than the swooning Call Me By Your Name soundtrack contributions or his endearment to the Midwest, and here, Sufjan is doubling down. Years after Rabbit’s recording, that style would resurge. After the success of Illinoise, Sufjan began to feel burdened by his literary stunts—historical fanfiction with footnotes, the logistics of touring with a marching band, and a concept as big as the Union. He retired the twee parade with the banjo and the trumpet. Then, bedridden by mysterious pain, he resolved to abandon the posturing of narrative for raw articulation—desire, agony, regret, apocalypse. A new urgency without exposition. This shift added qualifiers and hyphens to his music’s description. It lost him listeners. The religious imagery and tangents remained, now as iconography rather than parable. Age of Adz came out when I was 14 and very much 14. I felt spoken for by Sufjan’s new carnal mush as much as I’d felt lulled by his pastoral folktales. This song, likely recorded around the same time as Age of Adz, immediately snaps in the same way. The chord progression shifts sideways for a stanza to distinguish each refrain call from its response: Do you hear what I see?—do you see what I see??? Explosive drum fills and crooning vocoders echo and flicker, interrupting, questioning, and answering. Past the verses, the drum loops encroach as choirs rotate in and out and Sufjan’s voice gets increasingly garbled. I need you...to trust me…to feel you…Do you feel...like I do?...like I do?....aaaa...now…. The lyrics recount a series of vignettes concurrent with but removed from the birth of Jesus. Each verse advances an importance and immediacy to what’s witnessed. Unlike other historical fanfiction, (such as “Little Drummer Boy” or “Mary Did You Know,”) no one directly interacts with the Christ child. Rather, this song depicts the origins of the distant and disembodied urgency of Christmas cheer. Maybe this is the welling that the scholar-kings felt after noticing the mysterious star in the East. Maybe this is the welling that first “shone round” shepherds in a dark field and made them “sore afraid” until the angel explained that good news. This is still the welling we ritually manufacture each December, thousands of years removed. There’s something at the center of that warm fuzzy feeling that can only be described by recognizing. A star, a song—the religion classes I grew up sitting in might’ve called this “General Revelation”—the abundant obviousness of a god, and a god that is Love, not from dogma or prophecy but rendered from every angle by the transcendently beautiful world belonging to that god. Part of the mystery of the Incarnation is how a shooting star, a voice as big as the sea, and a shivering child can so immediately and obviously elicit the obligation to give one’s wealth and life away. And that this child will somehow bring goodness and light. Even knowing that this child is that god. Believing in a coming kingdom of that god, in this context, may mean believing the world will know peace when this child is really seen, heard, felt. So much of Sufjan’s songwriting reflects a need to understand and be understood. This sustains through his catalog despite a shifting backdrop of approach and musical style. I was first attracted to it in storytelling so vivid it’s rumored to be autobiographical—the relatability through heartbreaking specificity. It’s reinvented in unmitigated apocalyptic emotional expression. And eventually, it appears in a ten-album tribute to the self-inflicted nostalgia of the holiday season and all its preoccupations. All realizing and resolving: do you see what I see, now? Cotter Koopman has always lived in Grand Rapids, MI. He’s a graphic designer with a background in computer science, wearing off the freshness of his graduation. He’s trying to record a collection of Christmas songs every year, because, y’know.